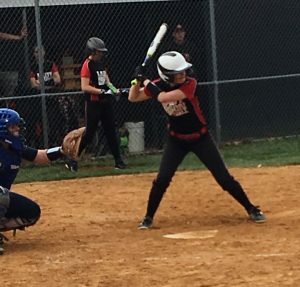 HYDE — After Clearfield rallied for four runs to create a tie game, Bald Eagle Area responded with three runs in the last two innings for an 8-5 Mountain League win in high school girls softball action at the Bison Sports Complex Tuesday afternoon. The Lady Eagles, who scored in every inning except the second, built a 3-1 lead when Mackenzie McCloskey singled and doubled to chase home runs in the first and third frames and courtesy runner Skylar Woodward turned Tobi Yarrison’s single into a run by circling the sacks with three stolen bases in the fourth. In the top of the fifth, they made it 5-1 on a walk, Brooke Woodward’s RBI double to the base of the fence in left center and, after Abby Fedder replaced starter Erica Hanes in the circle, Kaleigh Kinley’s sacrifice fly. The winless Lady Bison, who had totaled only four runs in their first four games, then erupted with a four-spot to take Hanes off the hook. 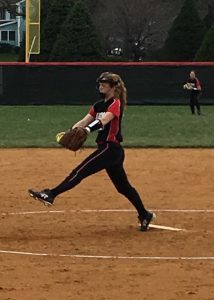 Karly Rumsky’s slap single, Molly Sartin’s soft liner to center field and the lone walk issued by Moreta Dyke filled the sacks, prompting a BEA pitching change. Hanes greeted reliever Zoey Surovec with a two-run single. One out later, Brooke Cline drove in Kirstin Norman with a sacrifice fly to right and Aspen Bishop capped her perfect day at the plate with a booming RBI double to leftt. “That was nice to see,” Clearfield coach Bob Lewis said. “Bishop has been struggling, and we’re counting on her for big things. Hopefully, this is just the beginning of something for her and she can get on a roll. “I was very pleased that the girls did battle back. They didn’t hang their heads. They could have easily given up and packed it in, but they showed a lot of heart. I think they proved to a lot of people what we’re capable of doing and what we’re striving for. The Lady Eagles converted a Fedder walk into the winning run in the sixth. Woodward, running for Yarrison again, raced to third on Olivia Andrews’ double to deep right center and sprinted for the plate when the Bison catcher threw to first base on Allison Hess’ swinging bunt single. BEA (4-2, 2-2 ML) added two insurance runs in the seventh as Madison Ripka sandwiched a double to the left center fence between two Bison misplays. Fedder suffered the loss despite giving up just three hits and one earned run in three innings. Hanes had allowed seven hits and five earned runs. Surovec picked up the win with three innings of three-hit, one-run work. Six Lady Bison joined Bishop in the hit column for the Lady Bison. Clearfield (0-5, 0-4 ML) makes the long trip to Spring Mills to play Penns Valley Thursday. Laccee Barnhart cf 4210, Brooke Woodward lf 4221, Mackenzie McCloskey 1b 3022, Caitlynn Close rf 4000, Kaleigh Kinley ss 3111, Madison Ripka c 2211, Olivia Andrews 3b 3011, Skylar Woodward pr 0000, Allison Hess dp 4010, Moreta Dyke p (flex) 0000, Zoey Surovec p (flex) 0000. TOTALS: 31 8 10 6. Erica Hanes p-rf 4112, Kyra Mollura 3b 4110, Brooke Cline ss 3011, Aspen Bishop lf 3032, Abby Fedder dp-p 2000, Makayla Ross 1b 3010, Karly Rumsky cf 3110, Molly Sartin c 2110, Makeeli Redden 2b 2000, Kirstin Norman ph 0100, Lindsay Hand rf (flex) 0000. TOTALS: 26 5 9 5. E – B. Woodward, McCloskey, Close; Mollura 2, Redden. DP – Bald Eagle Area 1 (Ripka and McCloskey); Clearfield 1 (Rumsky and Cline). LOB – Bald Eagle Area 8; Clearfield 4. 2B – B. Woodward, McCloskey, Ripka, Andrews; Bishop. Sac – Fedder. SF – Kinley, Yarrison; Cline. SB – Barnhart, B. Woodward, McCloskey, S. Woodward 3. CS – Rumsky (by Yarrison). Bald Eagle Area – Dyke 4+ IP (faced 3 batters in 5th), 6 H, 4 R, 3 ER, 1 BB, 1 K; Surovec 3 IP, 3 H, 1 R, 1 ER, 1 BB, 2 K.
Clearfield- Hanes 4+ IP (faced 3 batters in 5th), 7 H, 5 R, 5 ER, 3 BB, 2 K; Fedder 3 IP, 3 H, 3 R, 1 ER, 1 BB, 1 K.
W – Surovec. L – Fedder (0-4). Umpires – Joe Shick (plate) and Doug Metheney (bases).